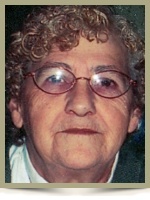 Putnam – Yvonne (Montpelier) Remillard, 72, of Woodstock Ave, died Wednesday, April 27, 2011 in Day Kimball Hospital. She was the loving wife of the late Ronald F. Remillard. Born in Thompson, she was the daughter of the late Ernest and Aurore (Desorcy) Montpelier, Sr.
Mrs. Remillard worked as a machinist for the Rexnord Company in Auburn, MA. She enjoyed knitting, going to Foxwoods, and spending time with her friends at the Thompson Speedway. Yvonne is survived by her sons, Robert Demars of Thompson, and Francis Remillard of Putnam; her daughters, Marie House of FL, Linda Bernier of CT, Donna St. Laurent of NH, Michelle McDonald of MA, and Betty Remillard of Webster, MA; her brother Raymond Montpelier of CT; her sister Jeannette Corriveau of CT; 18 grandchildren, and 11 great-grandchildren. She was predeceased by eight of her siblings. Relatives and friends are invited to visit with Yvonne’s family from 3:00 pm to 5:00 pm Sunday, May 1, 2011 in the Gilman Funeral Home, 104 Church St., Putnam. Burial will be at a later date. For memorial guestbook visit www.GilmanAndValade.com. Yvonne will be greatly missed as is Ron. There is a party going on in Heaven right now, so rejoice and let not your heart be troubled, but know that our Lord is good. May you find peace of heart and mind as you think on these things. Our hearts and prayers are with you during your time of grief and sorrow. Michelle and family, we are so sorry for your loss. You are all in our thoughts and prayers!